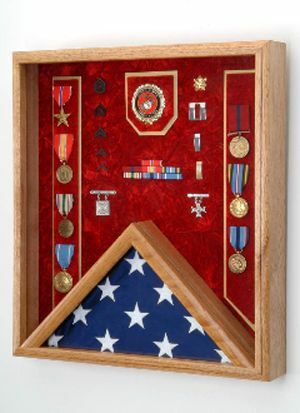 This case is ideal for displaying medals, memorabilia, certificates and a flag. Our shadow box units are made in the U.S.A., and inside the military flag display case is room enough to hold a 3 ft x 5 ft folded flag (flag is sold separately, see our Cotton American Flags). Constructed of only the finest solid oak or walnut, this case has a laminate panel back with hanger, an embossed 2 1/2-in. service emblem, crushed velvet background and a glass front. Optional personalized laser engraving is also available. The size of this case measures 18 inches wide x 20 inches tall.